When I decided to take an InterRailing trip in 2013, Nice and Barcelona were on my list of must-see destinations. From the research that I had conducted beforehand, I knew that travelling between these two cities was no easy feat but I hadn’t realised just how long-winded the journey could potentially be. When I went online to check the different route options, I found that the shortest option would take eight hours and involve at least two changes. I would also need to buy seat reservations for some of the trains but I decided to wait until I had arrived in Nice to do this. Big mistake. When I got to Nice and tried to buy the reservations, to my surprise, the official behind the counter told me that those particular trains were full. He then wrote down an alternative (long-winded) route that I could take which didn’t require any seat reservations – but it was 16 hours long and involved taking four trains! The first train in the morning was at 6.55am but thankfully the station was just a 5 minute walk from the hostel. Nevertheless, I woke up at 5am in order to get ready, do last minute packing (in the dark), check out and get to the station in good time. The first train journey was pretty uneventful. I tried to catch up on sleep (that didn’t happen) but I enjoyed the picturesque scenery. 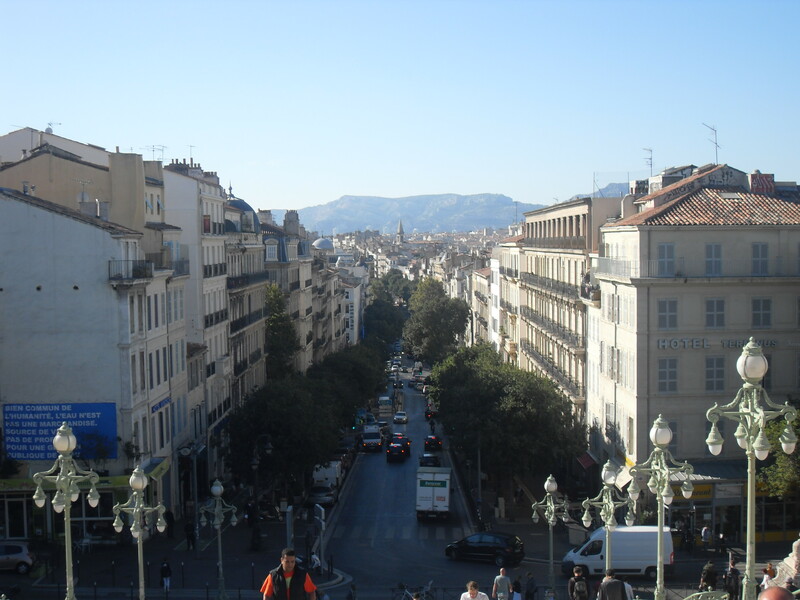 When I arrived in Marseille around 9.30am, I decided to put my backpack in a locker and do some exploring. After all, I didn’t have to catch the next train until around midday. When I got back to the station and found my way onto the next train, I spotted a guy with an InterRail pass in his hand so I decided to say hello. We got chatting and it turned out that he was also taking the same route to Barcelona! Ninety minutes later we arrived in Avignon, and with no locker facilities at the station, we decided that it would be too tiring to try to explore whilst carrying our backpacks so instead opted to buy some food and relax in a park (which also happened to have free WiFi!). After an hour or so of relaxation, we headed back to the station for a four hour train ride which took us across the Spanish border to Portbou where we met two girls and a guy who were also travelling to Barcelona. Thankfully, we only had to wait an hour for the next train. The journey to Barcelona took two and a half hours and by the time we arrived there, it seemed that only the five of us and two other guys (who had bicycles) were left on the train. As Barcelona Sants Station, was the last stop, we thought we would have plenty of time to get off the train and so by the time it was pulling into the station, we were just about leaving our seats. None of us were ready to get off when it finally came to a stop. Before they closed again and the train started to move! All of us looked at each other in disbelief. At first we thought that the train was just moving further into the station but once it started to speed up and all of the information about the stops and destination disappeared from the screen, we soon realised that we were being taken to the middle of nowhere! João, one of the boys was Portuguese but he could also speak Spanish and decided to try and find a guard or train official to see what on Earth was going on. He walked up and down several carriages but couldn’t find anyone and by that time, we’d already sat through 10 minutes of a high-speed blur of buildings, trees and graffiti-covered concrete. With no sign of the train stopping, panic started to set in. We had no idea where we were going and whether or not we would be able to get back to Sants Station that night. I for one didn’t fancy a night of impromptu camping! We endured another 10-minute haze of buildings and trees before the train eventually started slowing down and we plastered ourselves to the doors ready to escape as soon as the train stopped. It finally came to a halt at what seemed to be a train depot masquerading as a train station and we flew through the doors. By this point, it was after 11pm and we were tired, irritated and ready to demand an explanation from the train driver. However, João was the only one who could speak Spanish so he went off to find the driver in order to vent the frustration on our behalf. It turned out that this station was where the train was going to be kept for the night and earlier when it had arrived at Sants Station, the driver and guard has assumed that there was nobody left on the train because most of the passengers had disembarked at earlier stops. It had been running late and they wanted to get it to its final resting stop as soon as possible, hence why it only stopped for about two seconds! In order to get back to where we needed to be, we would have to go through the tunnel to a platform on the other side of the station, wait 5 minutes and then catch the train going back to Sants Station. However, in the time it took for João to find this out, the 5 minutes had already passed and the train was arriving on the on the other side. With our big backpacks on our backs. With two guys carrying bikes laden with luggage. Down the stairs, through the long tunnel and up the stairs on the other side. And we caught the train. Exhausted and out of breath. But the running didn’t stop there. Neither did the long-winded journey. When we arrived at Sants Station, we ran to catch the Metro to ensure that we didn’t miss the last train. The two girls headed off to their friend’s apartment and the two guys with bikes cycled off. I had booked a hostel in advance but João and the other guy we were with liked to throw caution to the wind and find accommodation once they’d actually arrived at their destination. So they decided to come to my hostel to see if there was any space. That would have been straightforward if the directions I had received from the hostel booking website had been correct. By the time we realised the error, we had already taken the Metro to a station that turned out to be quite far away from the hostel! We asked policemen for directions but somehow still managed to get lost. At this point, we were exhausted and fed up and had been walking around for what felt like several hours – with the weight of a large sack of potatoes on our backs. But thankfully João was still thinking straight. He used his phone to navigate and we found the hostel. After 18 hours of travelling. With only 3 hours sleep the previous night. It was no wonder I woke up the next day with a bad cold. It didn’t stop me going to the beach though!